(Nanowerk News) Barium titanate (BaTiO3) and lead zirconium titanate (Pb(Zr,Ti)O3) are well known ferroelectric materials that are used for fabricating capacitors and actuators. 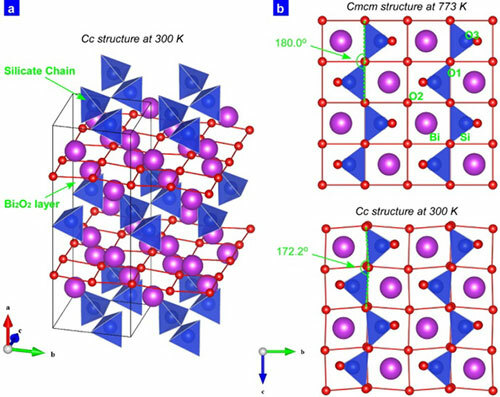 Their crystal structures belong to the perovskite-type oxide group (ABO3) with a BO6 octahedral coordination. However, new and important ferroelectric compounds with other structural groups have not been found during the last decade. Now, Mitsuru Itoh and Hiroki Taniguchi (present address:Nagoya University) and their colleagues have succeeded in the synthesis of new ferroelectric silicates with a tetrahedral coordination ("Ferroelectricity Driven by Twisting of Silicate Tetrahedral Chains"). The mechanism for the evolution of ferroelectricity was studied by both experiments and theoretical calculations. Structure of Bi2SiO5 at 773 and 300 K.
Single crystalline Bi2SiO5 was fabricated by a melting and solidification process via an intermediate glassy state. Dielectric measurements, Raman spectroscopy, X-ray structural analysis, transmission electron microscopy, and first principle calculations were conducted for single crystals. The refined crystal structure and calculated electronic and phonon structures consistently explained the ferroelectricity of this material appearing below 673 K.
The origin of ferroelectricity of Bi2SiO5 was attributed to the twisting of the silicate tetrahedral chains. This new finding may trigger materials research of new ferroelectrics with other structural groups and coordination numbers of 4, 5, and 7.